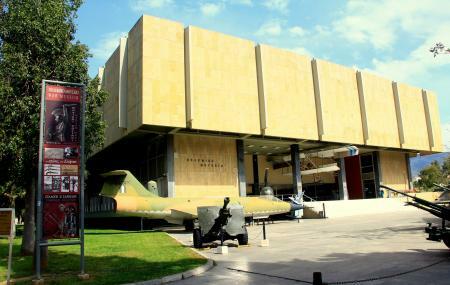 The Athens War Museum has a fascinating exhibit of Greece's war history through the ages, in chronological order. This also includes some 5th century BC Corinthian war helmets and replicas of weapons and shields from the different eras. Don't forget to check out the cinema which gives a narrated overview of the ancient Greek battles of Marathon, Thermopylae and the Trojan War. Outside the museum building is a wide variety of cannons and also four Fighter Jets. Admission is free on the first Sunday of every month. Free entrance for visitors exempted from fee by Greek legislation. How popular is Athens War Museum? People normally club together Daphni Monastery and Baby O while planning their visit to Athens War Museum. I really enjoyed all the military history starting with Neolithic history and going forward through the different era's. Some interesting exhibits and interesting history, especially around the ottoman independence and wars, which I was not very well versed. The best you can say coming away from a museum like this is you learned something and I certainly did. The fighter planes etc outside are just interesting to have a look at even if you don't have the time to go in. I definitely recommend you visit this fantastic museum at least once during your stay in Athens. Its purpose is the exhibition of weapon artifacts and the relevant research in the history of war covering Greek history. The are three floors begining with neolithic and ending on the top floor with World Ward 2 and beyond. Outside there's a plethora of planes, helicopters, missiles and lots more. Many of these can be sat in if you ask politely. Inside there is s so much to see that a simple review does not do it justice. There are genuine weapons, artifacts and clothing from many era's. All of which is expertly presented. In many cases the items (especially weapons) are outside of the glass cases and you are invited to touch and even pick them up. There are also some very interesting and thought provoking displays. These include several Greek resistance fighters during World World two. There's also a cafe downstairs, but I didn't have time to visit. All in all it's a great few hours out with lots to see and I'm sure a lot would keep the kids entertained. I will definitely be going back again. Museum gives a good impression of the Greek military history. From the Greek city states to the Greek independence war and WW2. All most all information about the displayed items is available in both Greek and English. Sometimes (for instance for some stone age items) is Greek only but that was maybe 5% of the exhibition. Most interesting parts of the Greek history (for me) were the periods of Alexander The Great and the Greek Independence war. As a Dutch national I never read a lot about the indepence war and it was informative to learn about it and the role the men and women of Greece played in this part of history. When reading all the information, the main exhibition will take about 2 to 3 hours. There was also another smaller exhibition, but I had to leave for the airport. In all a very nice museum when you are interested in military or Greek history.